According to ESG Research, 65% of organizations believe the skill level of their security team could be improved, and 48% are using more than 25 security products. This leads to more overworked staff and, ultimately, less effective security. A core evaluation checklist for replacing AV. Guiding questions to frame your evaluation to replace AV. How to run a test of next-generation AV solutions. 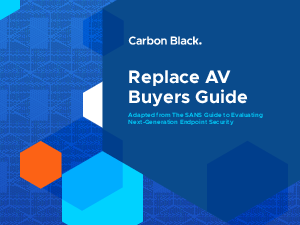 Learn more about replacing your traditional AV in the Replace AV Buyer's Guide.